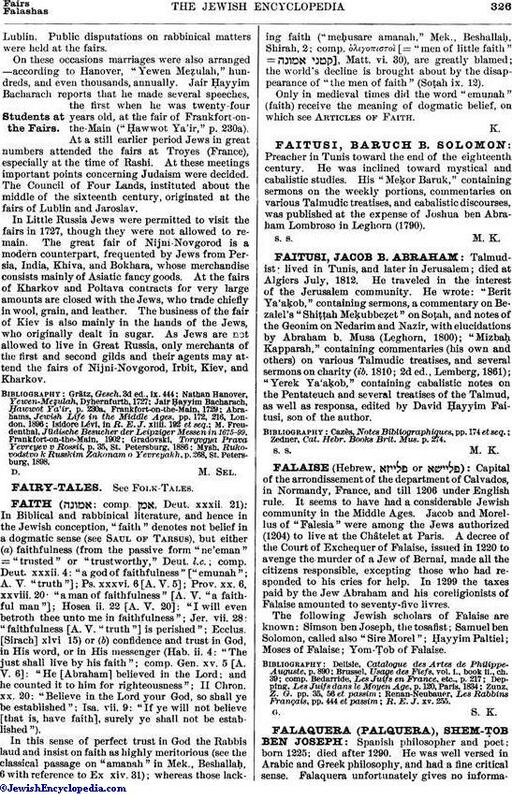 Talmudist; lived in Tunis, and later in Jerusalem; died at Algiers July, 1812. He traveled in the interest of the Jerusalem community. He wrote: "Berit Ya'aḳob," containing sermons, a commentary on Bezalel's "Shiṭṭah Meḳubbeẓet" on Soṭah, and notes of the Geonim on Nedarim and Nazir, with elucidations by Abraham b. Musa (Leghorn, 1800); "Mizbaḥ Kapparah," containing commentaries (his own and others) on various Talmudic treatises, and several sermons on charity (ib. 1810; 2d ed., Lemberg, 1861); "Yerek Ya'aḳob," containing cabalistic notes on the Pentateuch and several treatises of the Talmud, as well as responsa, edited by David Ḥayyim Faitusi, son of the author. Zedner, Cat. Hebr. Books Brit. Mus. p. 274.